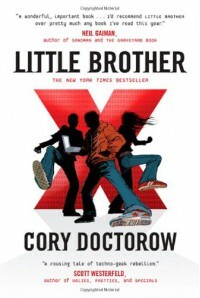 Cory Doctorow wrote a book about a possible reality that could happen any second in our day-to-day lives. In Little Brother terrorists attack San Francisco and as a result Homeland Security uses the potential threat that anyone could be a terrorist to supervise every single person creating a totalitarian regime. With all the technologies we have now-a-days, surveillance is not difficult. How far that could go is well documented in this book. Of course, Doctorow’s main character opposes the HSD and is a skilled hacker who fights hard, but what could have been an amazing book, turns out to be just mediocre. I could not connect with the main character at all. He was so whiny and his priorities so opposite to where mine would have been. The idea behind the book was great but unfortunately, the execution not so much. I was quite disappointed with the book. No recommendation from me.